In an ongoing effort to stimulate the local economy, State Senator Martin Sandoval (D-11) and Alderman Michael Zalewski met with a small but determined group of Garfield Ridge residents to discuss the redevelopment of Archer Road in Garfield Ridge. Archer Avenue used to be a thriving business and social hub for Garfield Ridge. Unfortunately, over the years many small businesses have either closed their doors or moved to neighboring suburbs. Approximately one year ago, a small but determined group of Garfield Ridge residents who shared a passion for their neighborhood began to meet and brainstorm on ways to redevelop Garfield Ridge and help make it conducive to business needs and pedestrian traffic. “Small businesses are the backbone of the community,” said Senator Sandoval. Working towards redeveloping Garfield Ridge as a small business haven, the small group of residents have since formally organized as Garfield Ridge Retail Entertainment and Amusement Team, otherwise known as GRREAT LLC. and started a Facebook page called "Redeveloping Garfield Ridge for Restaurants and Retail". After carefully evaluating and polling community interest and support via GRREAT's Facebook page, the group met with Alderman Zalewski and State Senator Sandoval to share the results and present an economic and redevelopment plan. Both the alderman and senator were very impressed and fully supported the movement. At the suggestion of Senator Sandoval, members of GRREAT also met with the managers of several local suburban and city redevelopment projects, most recently the Berwyn Development Corporation to gain insight and a road map for undertaking this project. 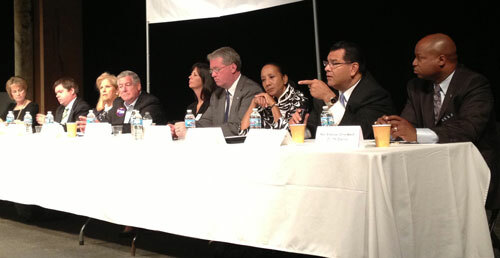 Senator Sandoval was an integral part of the recent redevelopment of Berwyn. “I’m not saying (other issues) are not important or shouldn’t be addressed, but let’s take care of the bread and butter issues today. We cannot survive unless our economy is strong." The goal of GRREAT, LLC is to redevelop the one-mile stretch from Harlem to Narragansett with streetscaping and to make it more pedestrian friendly for customers to find businesses. The goal is to attract a small handful of the right corporate businesses that will in turn create a ripple effect that will attract smaller owner operated restaurants and shops. We also aim to keep businesses that are very much a part of our community and help them continue to succeed. There is a lot of work to be done, but Alderman Zalewski has helped build a coalition of willing political leaders who deem the project worthwhile for businesses and residents alike. PHOTO: Senator Antonio Muńoz (left), Alderman Michael Zalewski (fourth from right) and Senator Martin Sandoval (third from right) embrace redevelopment of Archer Road in Garfield Ridge with the Garfield Ridge Recreation Entertainment and Amusement Team (GRREAT), led by John Kapusciarz (center) of European Chalet, 5445 S Harlem Ave.
State Senator Martin Sandoval (second from right) joined a panel of legislators to address pensions, gun violence and putting people back to work during the West Suburban Chamber of Commerce ‘Toast with the Most’ event. Local business owners had an opportunity to question legislators. “Making cuts to the middle class, which many of us represent, by cutting education and healthcare is not the path to economic growth,” said Senator Sandoval. “We need to look for ways to grow revenue and make capital investments in putting people back on their feet."